The Los Angeles Police Relief and Assistance Foundation (LAPRAF) was formed to provide financial assistance and other support to active and retired officers and their families that, through no fault of their own, find themselves in dire financial circumstances. The foundation was officially established in November 2007 by LAPRA in order to better assist the men and women of the LAPD and their families when there are serious needs beyond the resources of LAPRA. Contribute a small ongoing amount through a deduction from your paycheck. Make a tax deductible direct donation to the foundation. Add the foundation as a beneficiary to your trust or will. For more information on how you can make a donation, please call (213) 674-3724. 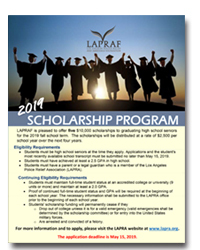 The LAPRAF awards four $10,000 scholarships to graduating seniors for the fall school term. Scholarships are disbursed over a four year period at $2,500 per school year. The application period for 2019 scholarships is going on now through May 15, 2019. Students must be high school seniors at the time they apply. Applications and the most recently available school transcripts must be submitted no later than May 15, 2019. Students must have achieved at least a 2.5 GPA in high school. Students must have a parent or a legal guardian who is a member of the Los Angeles Police Relief Association (LAPRA). Students must maintain full-time student staus at an accredited college or university (9 units or more) and maintain at least a 2.0 GPA. Proof of continued full-time student status and GPA will be required at the beginning of each school year. The necessary information shall be submitted to the LAPRA office prior to the beginning of each school year. Are arrested and convicted of a felony. Contact a LAPRA Benefits Representative at 213-674-3701 or 888-252-7721 or send an email to benefits@lapra.org.